The Yale Exoplanet Laboratory was contracted to design, build, and deliver a high-resolution (R = 60,000) echelle spectrograph for the Moletai Astronomical Observatory 1.65-meter telescope at the Vilnius University. The design was a fiber-fed, white-pupil architecture that operates from 400 to 880nm. The optomechanical design implemented a modular approach for stability and ease of alignment that can be reproduced for other telescopes. It utilized high-performance off-the-shelf optical components with a custom designed refractive camera for high throughput and good image quality. The instrument was commissioned at the Moletai Astronomical Observatory in June of 2015. A detailed description of the instrument was published in the Journal for Astronomical Instrumentation and can found here. The Yale Exoplanet Group successfully completed the installation and commissioning of the Vilnius University Echelle Spectrograph (VUES) over a 10 day period in June of 2015. Below you will find images from the installation process. 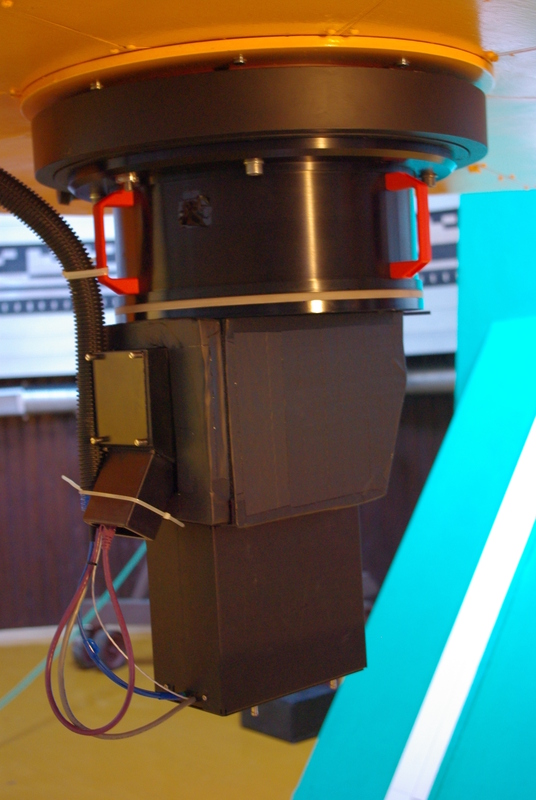 A side view of the assembled spectrograph with the thermal enclosure removed. The VUES front-end module mounted on the MAO 1.65-meter telescope. 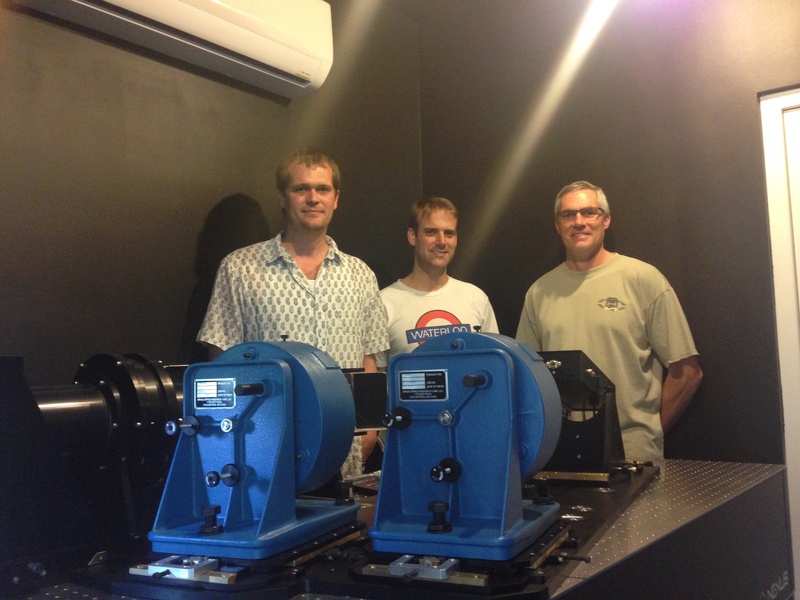 A portion of the Yale team standing behind the assembled spectrograph. The Yale Exoplanet Group recently completed the initial assembly of the MAO Spectrograph. Below you will find two time lapse videos (images courtesy of Build Pictures) from different angles showing the assembly process here in the Exoplanet Laboratory at Yale. Final testing is on schedule to be completed by the end of April, at which point the instrument will be shipped to Lithuania for commissioning. A white pupil configuration3 was selected for the spectrograph architecture. The optical layout is illustrated in the Figure 1. Light exits the fiber at f/5, and is then reimaged at f/10 at the slit mask. The reimaging optics are two available off-the-shelf OAPs from Space Optics Research Labs. They have a protected silver coating to increase reflectance in the blue end of the spectrum. Following the slit mask the beam expands until it is 80 mm in diameter at the main collimator OAP, where it is reflected to the R4 echelle grating. The optical layout of the MAO Spectrometer. Except for the cylindrical field flattener, the camera is an all spherical, modified Petzval design with a system focal ratio of f/6. All lens materials were optimized from the Schott preferred catalog filtered to exclude glasses with low transmission in the bluer end of the spectrum. The one material exception is that of the first lens, which was allowed to be calcium fluoride. Every surface is AR coated which yields an average reflectance of <1% from 400 to 880 nm. The spectrograph and reimaging optics are located on a passive vibration isolation table and surrounded by a hard, weather-proof, thermally insulating material. The insulating material is mounted in aluminum frames covering the top, bottom, and sides of the table. Individual panels can be removed for access to individual optical sections, or the entire upper half can be removed using a pulley system. The pulley system is mechanically balanced so that a single individual can remove the enclosure and have it suspended above the table without additional fastening. This is illustrated in Figure 2. Figure 3 is a view of the enclosure with the upper lid removed exposing the optomechanics of the reimaging and spectrograph components. The optical table is custom sized at 90 cm wide x 185 cm long. In the upper right of the figure it can be seen that the back-end of the dewar protrudes through the enclosure and into an adjacent electronics room (not shown) next to the spectrograph room. This allows servicing of the dewar without having to enter the spectrograph room, remove the upper lid of the enclosure, or disturb any of the optomechanics. The back-end of the dewar is also the connection point to the cryo-cooler lines as well as the vacuum interface. The spectrograph enclosure with the upper lid elevated. Figure 4 illustrates the modular philosophy applied to the optomechanical design of the injection and spectrograph optics. Optomechanical components are divided into three distinct groups (fore, mid, and aft), each group with its own template. Templates mount to the table, mounts interface with the templates, and templates interface with each other via two precision contact points (alignment pins). The templates are then fastened together using the template fasteners. This approach is advantageous from an alignment perspective because it positions the mounts relative to each other to machine tolerances. Therefore the instrument can be quickly assembled into a near-optimal alignment state. It also increases the long term optomechanical stability because it can help to reduce the number of degrees of freedom for alignment designed into each mount. For radial velocity machines not requiring extreme precision, this solution offers stability without a huge expense in terms of cost or technology. This makes it easily reproducible for other observatory applications. The template for the fore-optics grouping consists of the fiber input port, the two reimaging OAPs, the remotely controllable slit mask, and the transfer mirror. The f/5 beam exiting the fiber is converted to f/10 by the reimaging optics for input into the spectrograph. The slit mask enables three resolution modes of 30,000, 45,000, and 60,000. The mask is mounted to an off-the-shelf slide that can be remotely actuated via the control software interface. These components are shown in Figure 5. The fiber input mechanism and reimaging optics. Figure 6 highlights the design features of the echelle grating mount. The mount has x and y lateral adjustments to align the grating to the beam perpendicular to the optical axis. There are adjustments for azimuth (y-rotation) to set the off plane tilt, and elevation (x-rotation) to put the grating at the blaze angle. Removable clamp blocks on the mount allow for easy installation. Preload pads in the lateral direction hold the grating in place, and a there is a sliding protective cover. The MAO echelle grating mount. 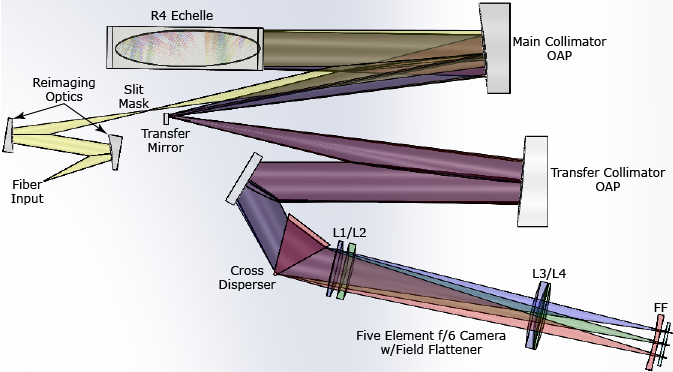 The camera grouping of optics includes four sub-groupings which are the cross-disperser, doublet L1/L2, doublet L3/L4, and the field flattener. Each of these sub-groupings are placed into individual modules that interface to the other sub-groupings via a barrel structure. The barrel structure fixes and maintains the concentricity from L1 to the field flattener, and builds in the angular relationship between the cross-disperser and the barrel optics. There are two brackets that interface the barrel structure to the alignment template. One located near L1/L2, and the other at L3/L4. This is illustrated in Figure 7. Alignment template pin locations are called out for interfacing of the camera group template to the templates of the dewar and main optics. Figure 8 highlights the sub-grouping mounts for the cross-disperser, and L3/L4 focus module. Common to all mounts are bullet-nose pins at the interface to the barrels. This is the mechanism that insures alignment between the different sub-groups. The individual doublet mounts maintain the proper spacings between the optics, as well as their internal concentricity. The L3/L4 mount has an additional degree of complexity in that it has a flexure stage for focus. Tthe sub-grouping mounts for the cross-disperser, and L3/L4 focus module. The dewar is mounted on its own alignment template that interfaces to the camera group. There are individual degrees for freedom for its alignment relative to the camera barrel in both translation, and rotation about the optical axis. Linear travel of ±5 mm is allowed for in both the x and y directions (z being the along the optical axis). The rotational axis has two stages of adjustment, a coarse stage with positions in 5° increments, and a fine stage that allows for 0.1° incremental adjustments over ±2.5°. This allows for fine coverage over the full 5° coarse rotational positions. The dewar and dewar mount.